Semisweet chocolate is made of 35%% chocolate liquor and is slightly sweet. It is most often used in baking. The higher the content of the chocolate liquor, the more rich and flavorful the chocolate will be. 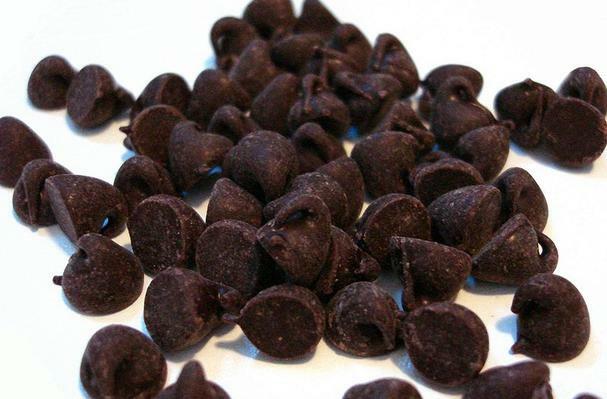 In Europe, dark chocolate is referred to as bittersweet, while in the US, dark chocolate is sometimes referred to as semi-sweet. A bar of fine dark chocolate can start at $2 bucks a bar and head upwards to what the market will bear. Price really depends on a number of factors, including: bean origin, cocoa percentage, production methods, connoisseur conviction, and branding. Fine dark chocolate tends to cost more than a crappy candy bar. You get what you pay for. Buying fine dark chocolate is much like choosing a bottle of wine. You can shop by location and by brand. When considering fine chocolate, you can choose beans grown from around the globe. Each location presents unique flavors and notes only possible given the particular climate, soil, and bean variety. Some of the most popular chocolate origins are (in alphabetical order): Caribbean, Ecuador Indonesia, Madagascar, Papua New Guinea, Sao Tome, South America, Trinidad, and Venezuela. The cocoa percentage proudly presented on fine bars refers to the total amount of cocoa in the product. This percentage can consist of a mixture of cocoa solids, chocolate liquor, and cocoa butter. The higher the percentage, the more cocoa the bar contains. Common percentages are 65%, 70%, 75%, 80%, and 85%. I once tried a 99% bar only to bust my face on the bitterness. If you’re new to dark delicious chocolate, start at around 65% and then go higher. * Cocoa: The dried and partially fermented fatty seed of the cacao tree from which chocolate is made. * Cocoa Powder (Cocoa Solids): Dry powder produced by grinding the seeds and extracting the Cocoa Butter. * Cocoa Butter: The pale yellow, pure edible vegetable fat of the cacao bean. * Chocolate Liquor: A mix of cocoa solids and cocoa butter. This is the stage in processing the cacao beans before the solids and butter are separated. A word of cocoa caution: Just because a bar contains more cocoa doesn’t mean it’s better or tastier. A high cocoa content is no guarantee for flavor. It’s the quality of the beans and processing methods that have the biggest impact on the final taste. Depending on the day of week and time of year, the media either tout or decry the health benefits of eating dark chocolate with high-cocoa content. Those that cite the goodness of cocoa believe that epicatechin, an active member of a group of compounds called plant flavonoids, is heart healthy. Apparently, flavonoids can keep cholesterol from gathering in blood vessels, reduce the risk of blood clots, and slow down the immune responses that lead to clogged arteries. Those that decry the healthfulness of chocolate say most people confuse the good cocoa rich bars with the bad candy bar crap, and eat the latter in great gusto. The anti-cocoa group also call the research bunk. There are numerous brands available to dark chocolate fans. Some of the most expensive, and popular include (in alphabetical order): Amedei, Bonnat, Domori, Michel Cluizel, Pralus, Valrhona, and Weiss. I am not against loving Lindt, as the price is right, the origins are varied, and the cocoa percentages are diverse. Plus, fine dark Lindt chocolate can be found at most grocery, drugstores, and Amazon. Buying: You can buy dark chocolates at any supermarkets or online. A study being reported in the journal Heart finds that dark chocolate may reduce the risk of hardening of the arteries in smokers. Researchers found that two ounces of dark (not white) chocolate improved blood flow in the arteries. Smokers are at higher risk of hardening of the arteries that restricts blood flow and can lead to heart attack. This study does not lessen the importance of not smoking as a means to heart health, but it does emphasis the importance diet in our wellbeing. History: Dark chocolate history goes back at least 3000 years. What began as a bitter drink in the pre-historic tropics of South America has become one of the world's most popular treats. For most of this time, dark chocolate was the only form. So chocolate history is really the history of dark chocolate. Throughout the tropical areas of Central and South America, a room-temperature drink made from cacao seeds has been enjoyed for several thousand years, with the earliest documented usage between 1400 to 1100 BC. Pre-columbian societies, through the Maya and Aztec, used the drink for ceremonial and medicinal purposes, and also as a luxury for the elite. This drink was very bitter, and was laced with various additions such as vanilla, chili pepper, sometimes alcohol, other spices, and corn meal. It was served warm, with no sugar or other sweetener, and would not be particularly recognizable today. Columbus was exposed to the native chocolate drink, but was unimpressed. It was not until Hernando Cortez arrived that the value and possibilities in Spain were recognized. The Spanish added cane sugar, or sometimes honey, to the formula, and also started serving the drink hot. For almost 100 years the secrets of chocolate belonged exclusively to the Spanish, but then spread throughout Europe. At first, chocolate was available only to royalty and the nobility, but was later made available in coffee and chocolate houses to any who could afford the expensive luxury. Until this point, all chocolate was dark chocolate, so the history of chocolate was dark chocolate history. It wasn't until 1689 that milk was added to the chocolate drink by Hans Sloan in Jamaica. During the 19th century, chocolate changed from a dark chocolate drink available only to the rich, to the inexpensive, mass-produced, eating chocolate that we enjoy today. The development and growth of large plantations and markets, and the industrial revolution and mass production techniques, led to chocolate that was inexpensive enough to be available to everyone, and developed some of the names we are still familiar with today. In 1828, the Dutch chocolate maker Conrad van Houten invented a hydraulic press to make cocoa powder, and an alkanizing process used to mellow the taste, and to make the powder easier to mix with water. This process is now known as the "dutch process" or "dutching process". In 1847, Fry and Sons of England created the first solid eating chocolate using a process similar to that used today. This product was, of course, a dark chocolate. Cadbury's began business operations in England in 1860. Tobler was making hand-made chocolates in Switzerland in 1864. By 1876 the Swiss were adding dry milk to the formula to make milk chocolate. Lindt invented the conch in 1879. Milton Hershey began operations in 1894. And in 1899, Lindt and SprÃ¼ngli were formed, and Tobler opened its first factory. In the 20th century, mass distribution greatly increased the range and world-wide popularity of chocolate, with milk chocolate becoming the "primary", most popular form. But, by the late 20th century, and into the early 21st, dark chocolate, the original, has been regaining popularity.